Traumfabrik (German for "Dream Factory") is the Reiner Knizia game of making classic Hollywood movies. 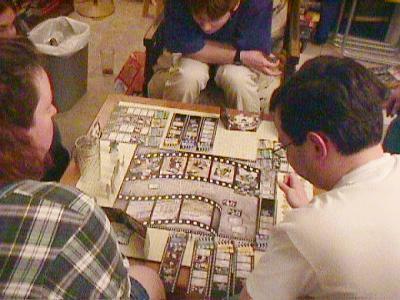 Each player plays a studio; at the beginning you are given three movies to complete, one in each of three genres. Your goal is to line up the personnel to complete the rosters for these movies (actors, directors, cinematographers, etc.). There are four rounds in which players bid against one another for personnel rated by stars (zero to four stars in most cases, with one notable exception: Reiner Knizia, a -1 star actor). The total number of personnel's stars for a movie is the movie's score. Both speed of completing a movie and high score count because studios that complete movies get to draw extra movies, and there are bonuses for completing the first movie in a genre and for high-scoring movies at the end of each round, as well as at the end of the game. There are more details, but that's the gist. Thanks to Marty for this recap. There is a second edition, Fabrik der Traume (name changed because of some trademark dispute). One nice thing about the first edition is that it includes an audio CD of mostly swing music from the era of the movies being made, which the players put on the stereo while they were playing to add atmosphere. A very nice "bit". Charlton Heston in Bambi: "Venison is PEOPLE!"